Donated to City of Winnipeg Archives, 2007/16. 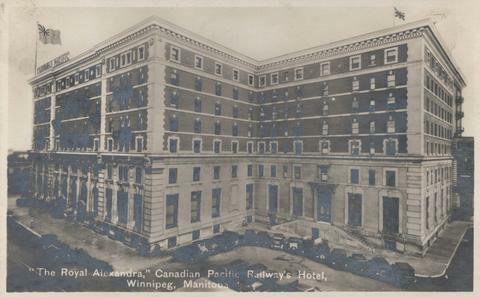 Item consists of postcard in printed format that shows the Royal Alexandra, the Canadian Pacific Railway's Hotel. Now demolished, the Hotel once stood at the northeast corner of Higgins Avenue and Main Street. - Published by Valentine Edy Company, Limited, Winnipeg, Manitoba. Printed in Great Britain. Date of postcard is unknown. Black paper residue on back. Appears to have been removed from scrapbook or album.